For any interview, preparation is a very important process.The more the preparation you do, more will the chances of landing to the job. Analyze the whole job description posted by the employer. Go through your resume carefully before attending the interview. Carry an extra copy of your resume and a notebook. Dress formally for the interview; your appearance should mirror the maturity and self-confidence. Try to reach the interview place atleast 15 minutes early. 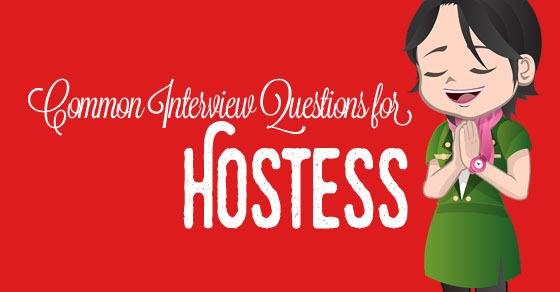 The following mentioned are few interview questions for hostess jobs. This is most probably the first question you might come across. “Tell me about yourself” is one of the common questions but you can answer in the most impressive manner. This question must be answered with the utmost confidence as only this question will help you get recruited. When you tell about yourself, tell your interest, your hobbies, why you chose this job and so on. 2. What was your previous job about and why you left the job? The very next question comes related to the previous job. Why you left that job. For that, you need to give a very concrete reason and make sure it is positive for the company. For instance, you can say that the distance of the company from the house was too far and it was difficult for you to cope and commute on a daily basis. If you will say something negative, the interviewee will know that you have the potential to say wrong about any company you work. 3. Tell about the greatest achievement? When asked this, you may take time to think as you might not have an achievement as great as reaching the moon by Neil Armstrong but need not worry. When you are asked this type of question, just tell about any of your project that you completed or any challenging experience you gained success in etc can be your one of the greatest achievement. 4. Why you wish to work as hostess? You can say that you have been working in this hostess career since two or whatever years. Also you like to see people happy because of your good, direct and indirect service. So, the happiness on the faces of people keep you intact and working in this field without any issue or problems. 5. Tell about the experience in this field of hostess? Here you have to explain about the best as well as the worst experiences in being a hostess. What you have learned from each good and bad experience will help you in answering this type of question. You have to tell all the hostess duties like preparing tables and greeting customers, then presenting and taking their orders, etc was the profile of you as a hostess. You have to tell that you can do it in the most appealing manner. This is one of the most challenging questions ever asked to the interviewees. To answer such type of question you need to be true as you may get tested on the spot. So, it is better to be true. 7. Tell about your weakness? Here you have to answer in a smart manner. If you make and tell list of what you cannot do, then you are surely not going to get recruited. So, in order to avoid any such problem, better to answer like that you do lack patience, but you are ready to build it over time. Such kind of positivity will help you turn the tables. 8. Tell about the long term goals as a hostess? Employers very well know that every employee has some or the other goal. The recruiter asks about it to know the goals and the dreams. And you ought to answer it. Many people make mistakes like having own business is the goal. Such kind of answer must not be given as no company would like to have the person who will be leaving the company in a few years. To give such type of answer, just do not mention your personal goals, but refer to the company goals. 9. Reason of applying in this company? You can answer this reason in a confident manner saying that you went through the website of the company and came across the rules, the policies which you found really authentic to follow. Also many things about the company, suits your nature as well as the work culture represented on the website that attracted you to them rather than any other company. 10. What according to you are the risks in this job and how you overcome that? This can be the most simple question also and for many this could be the most difficult question too to answer. You have to answer in the diplomatic manner that every job has some risks. One should not get afraid of the risks it has but should remain peaceful and find easy solutions to them. For this, one needs to be observant enough and should have farsightedness for the problem so that it could be solved within no time. 11. How to maintain such jobs for a longer period of time? Here you can say that one needs to have patience first of all. Then you need to be focused enough for the work you do. Build interest and then see automatically you will be able to work for a longer period of time in such a job. Most importantly, you have to enjoy what you do and if you do not enjoy, you will probably leave every job you join. 12. Describe the steps to manage the activities? In order to describe the steps, you can say that, first of all assign the work to different people in your team. Then monitor their work, tell them if they are doing something wrong. Explain them the right method and correct them . This will not only show your leadership qualities but also you will be able to tell the steps to manage the activities related to the work of hostesses. 13. How will you serve VIP guest? By making special arrangements, putting their personal preferences on the top, taking them to the halls, giving them the best place to sit, assigning them the best serving waiters, work according to their likes and dislikes like the decoration and so on. All such things will be taken into account and will be focused on. 14. How do you react to the criticism? Reacting to criticism in the positive manner is appreciable. This is because when you react to the critics in a positive way, you instill the urge to learn rather than cry over the mistake. So, when you have the urge to learn, you automatically react to the criticism in a healthy manner than taking it and spoiling your whole day. So this question can be answered in a positive manner. 15. What have you learned from the mistakes you did previously? You can tell how to speak and more importantly, which words to speak and which words not to be used. All such things you learned after making mistakes. But whatever mistakes you made, little or big, helped you in learning some or the other thing which is great and appreciable for every organization and the company. 16. What is the most recent thing you learned that you think will help getting this job? The most important thing is patience. If you do not have the patience then you can never be successful hostess. Not just this, you also learned how to look interested even if you do not seem to. These are some of the skills that one should have, because we all are human beings and no matter what, humans do get tired. So, in order to make yourself look refreshing and appealing all the time, you need to learn the important facts and other things. 17. What would you do in case of emergency? In case of emergency, you will take guidance from the superiors and then act accordingly. This is because, in the emergency situation, you may fall short of memory which would help you know what to do and what not. This will help you in relaxing and then lending your hand to the supervisors also. So, this kind of answer you can give during the interview, if such kind of question is asked. Tell about your hobbies, like cooking, dancing, relaxing, reading a book might be your hobby. So, tell about your hobby and also if possible, explain by relating the hobby with your profession. That is by saying how your hobby helps in your profession. 19. How would you describe your job to others who think it to be not good job? There is no need of describing this type of job to others who think it is not a good job. This is because, till the time you are enjoying, you should not think who likes your job and who does not. No one is responsible and neither you are answerable to anyone. So, if you describe your job, need not add extra colours to it as if people are sensible enough to respect every job, then they will understand it. 20. What according to you are the most important aspects of this job? The most important aspects of this job are the caring and concerning attitude. A person must have such an attitude so that the level of patience is maintained and no discrimination is made when attending different customers from heterogenous backgrounds. Not just this, the quality of communication, presentation and anticipation is need of this job. These all form the most important aspects of this kind of job. 21. Did you read the description of job before coming? And if you have done, then are you clear with the profile? Yes, you read that and you are certainly clear with everything. You are pleased to say that you will be able to manage all what you have asked for into the profile. Never say you just read it half and half is left. This is because, if you will say such thing, you will be putting wrong impression on them, which you certainly do not want. So never say all such, even if you have not read it full, just say yes you did, because if you are in need of a good job, you will have to do well in all circumstances. 22. What are your expectations from the company? Here you can say what you have thought of and what you actually wish to have with the company. If you feel like the company can fulfill your demand and also it is sensible enough, then you can surely put forth the demand and tell all the expectations you have from the company. 23. What according to you, are the qualities one must have? For this type of job one must have a good personality. The sense of wearing clothes. The way to represent yourself and the most importantly the way you communicate to each other. Although it is an essential credential for all sorts of jobs, but for this it is the most important one and one must possess these skills on the top of the list. So, this question can also be answered by the way of explaining about your skills and putting forth them in front of the panel. So, above are some of the important questions that are asked during the interview for the hostess position. The above hostess job interview basics questions must be answered with confidence as many times, they ask tricky questions which become difficult to answer and whenever you answer them you out to fumble which is the sign of lack of confidence. Not just the above questions, but also if any of the other questions come your way during the interview, make sure you do not lose your confidence and be intact with it as the confidence is the key to cracking all the interviews.